**FIRST MONTH RENT HALF PRICE** - Crofts are pleased to be advertising 'To Let' this three bedroom mid terraced house, very well presented in a position convenient for Grimsby or Cleethorpes. The recently upgraded property boasts a generous fully fitted modern kitchen with an electric oven. To the ground floor there is also the added benefit of a utility room, a spacious through room lounge/dining area and a downstairs bathroom. 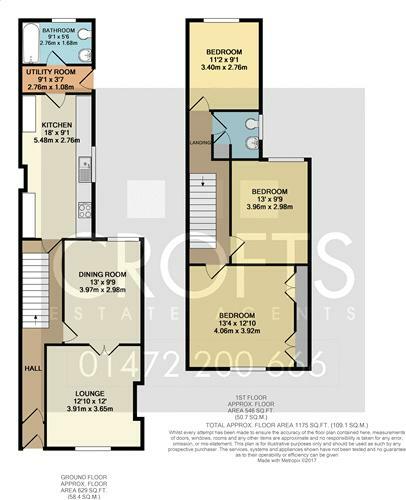 The first floor comprises of three bedrooms, two of which are doubles with a single to the rear and WC. The property is heated by a gas combination boiler and is partially double glazed and has a good sized rear garden. Monthly rental of £450, Deposit of £650. The landlord is planning to build a new wall at the front of the property with a gate for access. The front garden is concreted for easy maintenance. There is an outer uPVC door with an inner wooden door. The hall has laminate flooring for easy maintenance and is neutrally decorated. Neutrally decorated walls with uPVC double glazed window to the front elevation and a feature fire and fireplace. Neutrally decorated with a window through to the hallway, there are double door connecting this to the lounge. Newly fitted kitchen with uPVC double glazed window to the side elevation. There is new vinyl flooring and electric oven in the property for us by the tenants. There is the added benefit of a utility to place a washing machine and also the door to the rear. Fitted bathroom comprising of a three piece suite and an electric shower over the bath. uPVC double glazed window to the rear. Neutrally decorated with uPVC double glazed window to the front elevation and two internal wardrobes making full use of the space. Neutrally decorated bedroom with uPVC double glazed window to the rear. Low flush WC and handbasin. Neutrally decorated bedroom with uPVC double glazed window to the rear. There is a built in storage cupboard too. Fenced to all boundaries, with a lean to at the side of the house. The garden is mostly concreted with mature flowerbeds.